As a lean organization, we utilize the strengths and capacity of a few individuals to manage our fundraising, events, camps, and programming. Bridget joins The Goodtimes Project staff after being a longtime volunteer not only at Camp Goodtimes but also on our Gala planning committee and Board of Directors. Professionally, Bridget has been working in nonprofits for almost 20 years most recently at Woodland Park Zoo as their Philanthropic Events Supervisor and Cedarmere Foundation as their Grants Manager. She has a Master’s degree in Nonprofit Leadership from Seattle University and a B.S. in Environmental Science from Gannon University. Kimberleigh manages our fundraising efforts, including the annual Goodtimes Gala and Auction. She has previously volunteered with Camp Kesem at Ohio State University, serving two years as their Make the Magic Benefit Gala coordinator. Along with her fundraising experience, she brings her creativity and camp spirit to her work. Tanya manages our camp programs, including Camp Goodtimes and the Kayak Adventure Camp. This includes the hiring of staff, procurement of supplies and donations needed to run a memorable camp session, and acceptance of campers. As a former The Goodtimes Project volunteer and marketing and communications manager, Tanya brings both heart and knowledge to the position. Becky manages the organization’s new program development (pilot programs), as well as collaborates with the Camp Director on summer camp programming needs and assists the Development Director with fundraising events. Previously, Becky volunteered as the Activities Director for Camp Goodtimes, she brings knowledge and experience in creating and implementing youth-based programs. Our Board governs the strategic vision of our charity and sees to the needs and support of its employees and constituents. The members of our Board represent a diverse group of community leaders throughout Western Washington and Alaska. Many members are long-time camp volunteers, while others bring business acumen and outside perspectives. Together they are united behind the mission. Managing Director with Northwestern Mutual and a Wealth Management Advisor, Luke is a proud supporter of The Goodtimes Project and has been a member of the board since 2015. Daughter of Camp Goodtimes founder Charlotte “Lion Tamer” Ellis, Allison has been involved with camp since 1986 as a volunteer staff member, program planner, and board member for Children’s Oncology Camps of America (COCA). Inspired by her experiences at camp, Allison launched several award-winning online projects for kids and teens in the 1990s and early aughts and is now out on her own as a freelance writer. She joined the board in 2018 and is thrilled to be a part of the next Goodtimes generation. Oliver is the parent of a child with cancer. His kids have been campers, and he's honored to now serve The Goodtimes Project in his role on the board. He is also active in raising money for pediatric cancer research, because the only thing better than camp is a cure. Oliver is a software executive at Adobe. He joined the board in 2018. Kelly is the mom of two enthusiastic Camp Goodtimes campers. She is the Director of Hero Funds for the St. Baldrick’s Foundation which works hard to raise funds to support lifesaving childhood cancer research. She joined the board in 2018. A Camp alumnus. Vice President of Operations and Market Integration for Kaiser Permanente. Martin has been on the board since 2015. A Senior Consultant at Zillow Group, Zach's degree is in Crisis Communications/Integrated Marketing from the University of Washington. He has been with the Goodtimes Project since 2013 serving as a camp counselor and, most recently, a Unit Leader at Camp Goodtimes. Zach graciously served as the 2018 Goodtimes Gala Chair. Craig is the father of two high schoolers who, even in their teenage years, say that Camp Goodtimes is their favorite week of the year. 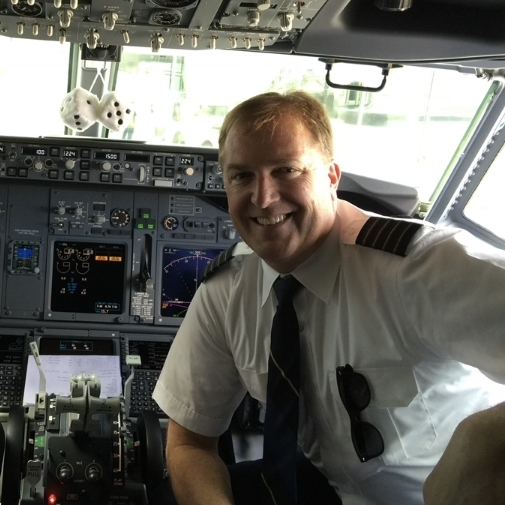 Craig is a Captain/Checkairman for Alaska Airlines and is marred to his other cancer fighting hero, Cathy. In his free time, he likes to combine two of his interests, cycling and raising money, to aid in the fight against cancer. In addition to a passion for our mission, Craig brings years of non-profit board experience to this position. Inspired by his children, Craig has been a huge fan of Camp Goodtimes since 2008 and is honored to be on the Board of The Goodtimes Project. Wade is the neuro-oncology social worker at Seattle Children’s Hospital. He has spent his entire career working in oncology, the majority of the time, working specifically with children and families impacted by a pediatric brain tumor diagnosis. Wade is excited to be a member of the board and help support the amazing work The Goodtimes Project provides to all families who have a child with cancer. Megan started with Camp Goodtimes in the summer of 1999. Initially a cabin counselor, she went on to serve in many other roles including med shed nurse. She was part of the founding board of The Goodtimes Project, and loves all things camp, including her husband whom she met at camp. In her regular life she is the Advanced Practice Provider Supervisor in the Emergency Department at Seattle Children’s Hospital. She has two kids, 3 and 5 who keep her tired, busy and laughing. Corporate Giving Coordinator for Make-A-Wish Alaska and Washington, Thailan is an up and coming non-profit professional, and a veteran camp counselor who has been involved with Camp Goodtimes since 2012. He is committed to the kids and families that The Goodtimes Project serves. Practice Plan Administrator for Fred Hutchinson Cancer Research Center, Laura has worked and volunteered in oncology administration, fundraising and nonprofit management since 2002. Masters degree in health administration from the University of Washington. Honored to serve the Camp Goodtimes community.